“Germany itself faces strict austerity to comply with the national debt brake,” said the declaration, which will go to the Bundestag next week. Lawmakers said there is no scope to boost the EU’s “firewall” to €750bn, either by increasing the new European Stability Mechanism (ESM) or by running it together with the old bail-out fund (EFSF). The US, Asia and Latin America are irked at the reluctance of Europe’s rich creditor states to put out the raging fires on their own doorstep. “The Europeans need to do more. That would unlock more support for the IMF from the other G20 countries,” said Augustin Carstens, Mexico’s central bank governor. The spat came as Brussels warned that Euroland would relapse into recession this year, shrinking by 0.3pc. Italy is expected to contract by 1.3pc and Spain by 1pc. “Negative feedback loops between weak sovereign debtors, fragile financial markets and a slowing real economy do not yet appear to have been broken,” it said. Stock markets slid for a third day as optimism from the Greek deal dissipates. In Athens, the Greek parliament approved the debt swap with investors, which Commerzbank’s chief Martin Blessing described as less voluntary than “a confession to the Spanish Inquisition”. The EU’s own experts doubt that it will be enough to put Greece’s debt on a sustainable path, while market analysts are scathing. “We forecast a further prolonged economic depression that would leave the debt to GDP ratio at about 160pc to 170pc in 2020,” said Citigroup. Mark Weisbrot, from Washington’s Centre for Economic and Policy Research, said Greece should default and leave the EMU. “Is the euro worth this kind of punishment?” he said. The Merkel government is in a delicate situation. 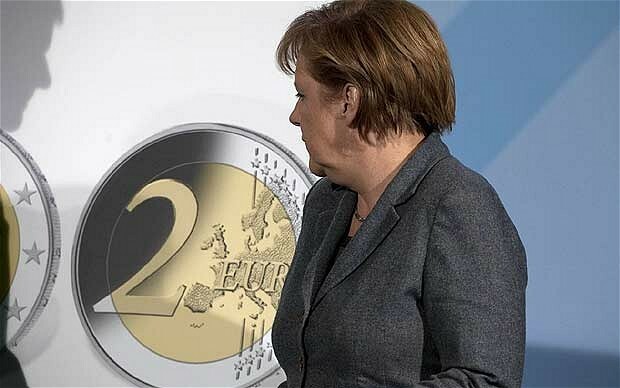 It assured the Bundestag in September that Germany’s exposure to EU rescues were capped at €211bn. A major boost to the ESM would push the figure above €300bn, requiring the trauma of a fresh vote. Moreover, Germany’s constitutional court has warned any rescue commitment exceeding one-year’s budget – €306bn in 2012 – threatens stability and may violate Basic Law. Graeme Leach, the Institute of Directors’ chief economist, said Berlin’s “fiscal compact” to police the budgets of EU deficit states is in no sense a fiscal union. “Germany has not agreed to eurobonds or North-South fiscal transfers. Europe can’t find a solution because there isn’t one. “There is zero chance that the eurozone will survive in current form this year, and Greece will be out by the summer, just in time for cheap holidays,” he said.